CSAC never gives up on our dogs. Sometimes that philosophy can lead to costly decisions. Meet Ginger. 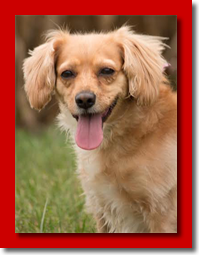 Ginger was turned into CSAC by her owner who was having difficulties with her. Ginger's former owner liked to care for medically needy Chihuahuas. Ginger started to not like the Chihuahuas. Other than the not liking of small dogs, Ginger sounded great. She was house trained, obedience trained, crate trained, and did not have a bite history. She wanted to have her own space and wanted affection on her own terms - she was a bit of a loner. Well, Ginger was not that easy. 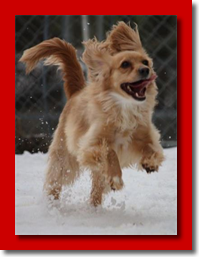 Over the course of the next year and a half, CSAC arranged to have numerous potential adopters meet Ginger. Ginger was her own worst enemy. She would growl, snap, and scare away everyone we sent her way. The Kennel Buddies who met with her during her stay loved her. She was great with them. She went for walks, played and interacted with some other dogs with no problems. We had a behaviorist evaluate her, and she confirmed what we suspected, “Ginger is a dog that suffers from anxiety and fear of unfamiliar objects and people. She needs a home without children and with people who will allow her to adjust to them and the environment at her own pace, without experiencing pressure.” We created a plan for future adopter meetings, they would have to meet her over an extended period of time along with our Kennel Buddies to gain her trust. We finally found an angel. Over a period of a month, Ginger's Angel made frequent visits to meet Ginger along with the Kennel Buddies that Ginger trusted. It started with short walks, feeding treats and time spent hanging out to gain Ginger’s trust. Ginger finally has made it home. We are starting the Ginger Fund. Not giving up on Ginger and keeping her for her extended stay came with a hefty financial responsibility. The Ginger Fund will help offset the cost and hopefully grow so that we can continue to never give up. Your tax deductible donation is greatly appreciated.